Since the advent of social media, online customer engagement has become crucial for effective marketing. Millennials are the largest demographic generation today and 46% rely on social media to influence their online purchasing decisions. That alone should tell you that this is a great place to focus your marketing efforts. But if that isn’t enough, here’s another fact: the amount spent on ads through social media reached an estimated $30 billion in 2018. Brand awareness is key in marketing and may be the most important part. You need brand awareness to build profit potential and overall value. 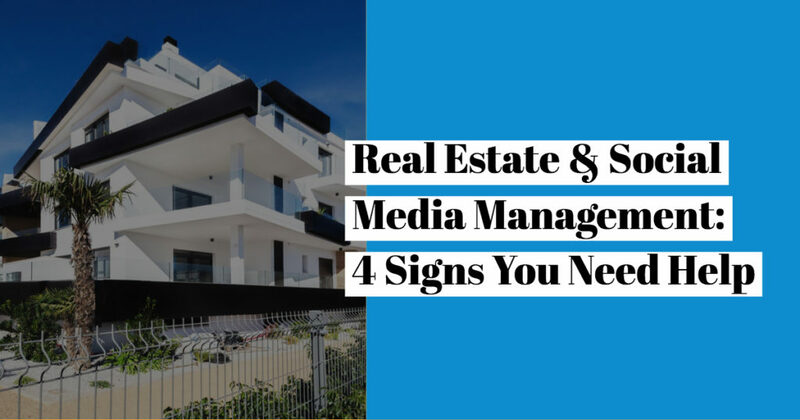 Social media enables people to quickly communicate about their favorite real estate companies and agents, good or bad, making it critical for businesses. If people aren’t recognizing your brand, it may be that you need help with your social media marketing. If sales have plateaued or decreased, it could be that you need more social media presence. There are 2.3 billion active social media users worldwide. That creates a lot of opportunity for business owners to reach potential customers. You’re trying to run a business. But you also need to run your marketing. If you don’t have an employee with marketing expertise, you could be hurting your business. Having someone to handle your social media would free up time you desperately need to keep your company going. Devoting many hours per week to social media isn’t possible for most business owners. Creating visually appealing ads, viral posts, and doing so regularly to build your presence takes dedicated resources you may not have. But if you’re not able to devote a proper amount of time to your social media presence, it isn’t going to work for you. When used properly, social media is one of the greatest marketing tools available. But no one can do it all themselves. At Brady Mills, we’re passionate about helping real estate companies reach their full potential. Contact us today and let us help you move forward into tomorrow.